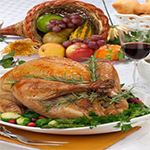 FRIDAY, Nov. 14, 2014 (HealthDay News) -- Many people gain weight at Thanksgiving because they eat too much and don't get enough exercise. But, a few simple steps can help you keep your weight under control while still enjoying the holiday, an expert says. A good place to start? "Remind yourself how it feels to overeat," Kristen Kizer, a registered dietitian at Houston Methodist Hospital, said in a hospital news release. "Remember there will always be leftovers, so you don't need to overindulge in one sitting." It's also important to eat a satisfying breakfast so that you aren't starving when you sit down for the Thanksgiving meal, Kizer advised. Before the gathering, decide whether you're going to have either alcohol or dessert, but not both. If you choose dessert, pick one item and enjoy it slowly. If you decide on alcohol, select a drink with lower calories, such as a wine spritzer, and drink in moderation. Avoiding creamy holiday drinks can save hundreds of calories, Kizer said. If you're cooking the Thanksgiving meal, leave marshmallows and brown sugar out of the sweet potatoes. Slim down your stuffing by adding more vegetables such as celery, onions and carrots, and skipping fatty meat such as sausage, she suggested. When making desserts, use natural applesauce instead of oil or butter in your recipes, Kizer advised. The applesauce will add moisture and flavor to your baked goods, along with fiber and nutrients. Prepare less food. For example, instead of offering 14 dishes to family and friends, try cutting down to about seven dishes. You'll save time and money, and not have to eat leftovers for several days after Thanksgiving, Kizer said. And, don't forget to make exercise a part of Thanksgiving. Go for a brisk walk or a short run before guests arrive, or before heading to your holiday destination.